My toddler who once ate everything has suddenly become a picky eater. Here’s what’s working for us when it comes to handling his picky eating ways! Happy 2nd birthday to my second baby Anthony!! The one sticking his finger in the cake. Just like Momma! BUT FIRST! New to starting solids with your baby? You might find these starting solids resources helpful. 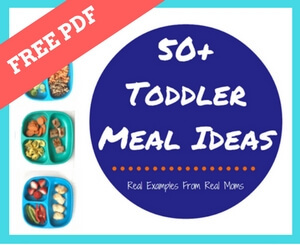 Not sure where to start when it comes to feeding your toddler? I’ve got your covered with this e-book— lots of recipes, tips, AND tricks from yours truly [and my good momma friend]. My second baby, Mr. Anthony, turns TWO today! Instead of talking about his love of hummus, obsession with dragons [specifically the movie Pete the Dragon], and his adoration of BOTH of his siblings, I’m talking this: picky eating. My human garbage disposal of a one-year-old toddler suddenly became a picky eater right around two years of age. GAHHH! Yep, thought I was in the clear with this one…. Anthony when he was almost one. See the variety on his tray?! Unlike Joey, when we started solids with Anthony we pretty much skipped purees and he ate bite-sized or soft finger foods. Essentially a modified baby led weaning approach. I figured we were in the clear since he accepted almost EVERY food early on, and from what I’ve read about baby led weaning, the early introduction of foods, textures, spices, flavors, etc. may help lessen picky eating later in life. Guess what? I STILL have myself a picky eater! Unless there is sausage. If there’s sausage Anthony is HAPPY! And hungry. We’ve gone through this before with Joey [who is now 3]. And guess what? I pulled out ALL the stops when it comes to handling picky eaters, and things HAVE gotten better. It’s taken time. And patience. But we are turning a corner, as Joey is starting to accept foods he used to decline [aka throw on the floor]. This gives me hope that this stage for Anthony will change, and he’ll grow out of it too! I’ve seen him pop a blueberry or two in his mouth when I’m not looking. Seriously. I think my kids have always been the pickiest with ME. Mom. The one serving their food. While I can’t leave the room every time he eats, I do encourage my husband, grandparents, and babysitters to keep on serving the healthy foods he so often refuses from me. Even though Anthony refuses certain food groups at every meal [some days it’s fruit, some days it’s veggies], WHAT and HOW MUCH he refuses varies from day to day. I tend to look at his diet from week to week vs. day to day to really evaluate if he’s meeting his nutritional needs. You can read more about toddler nutrition needs here. For Anthony, I don’t think he has a fear of new foods [food neophobia]. I just think food is something HE can control in his toddler life right now. But guess what? I can still control WHAT he’s getting. And when. Little Mr. will just have to decide how much he’ll eat. This is called the division of responsibility in feeding, which I’ve found works best for our family. Even when it comes to feeding my husband…. I’ve revamped our snacking habits, and really limited how much he gets between meals. Honestly, this kid could snack all day long. So could I! But the more he eats at snack time, the less he eats at mealtime. And just when I think all hope is lost he asks for some of my salad and eats it all! Because Anthony is now in this, “I do it myself!” phase of life, I’m assuming that’s what he’s doing with his food preferences too. All I can do is keep offering the “good” stuff, make sure he’s pooping, peeing, and growing right on track, and leave the rest up to him. If only it were that easy, right? !